Dr Abhaya leading workshop for government teachers. The first two of a series of one-day workshops on “Gender Representation and Academic Environment” were held at Christ University (deemed to be a University), India on 25 and 26 July 2018. These workshops were attended by 25 teachers from the Bangalore South Zone. Those attending teach English, Kannada, Social Studies, Maths and Science in government schools. 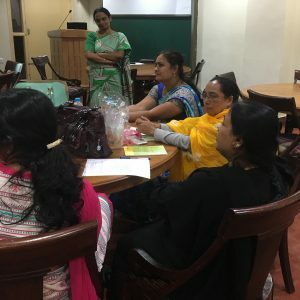 The workshops were organized in association with Liverpool Hope University in conjunction with the AHRC International Networking project, Articulating Women: Interrogating Intersectionality: Empowering Women Through Critical Engagements. The sessions were conducted by Dr Vagiswari, Department of History, and Dr Abhaya, English Department, at Christ University, and were enthusiastically received by participants. Many of the teachers were comfortable in Kannada, so both Kannada and English were used during the sessions. The workshops were interactive, focusing on the social construction of gender, on the expression of gender by teachers and students in an academic environment, on the influence of mass culture and the media on gender perception, and on gender representation in text books. Worksheets were used to prompt the participants to think about gender perception in regular life; these worksheets then provided a platform for extending the discussion to the academic sphere. Participants openly discussed their limitations and strengths when dealing with a sensitive issue like gender. They clearly recognized their social responsibility as teachers to facilitate, support, and sustain change in society, but noted other factors tending to weaken such an agenda: a system which holds teachers solely responsible for successful results, administrative responsibilities, and a lack of parental support to execute a socially relevant agenda. The session on gender representation in text books prompted the participants to question the implied gender biases in the construction of knowledge systems; this was a new thought, especially for science teachers. Consideration was given to using every day examples from the kitchen and other household chores to teach scientific principles as doing so would not just legitimate the work women perform, but also deconstruct the gender issues implied in constructing scientific knowledge itself. The participants indicated that more workshops on gender representation will equip them to deal with the complexity of the issue effectively, as many of them encountered the issue of gender and academic environment for the first time. First session of workshop for government teachers on Gender Equality and Academic Environment.